As we gear up for our 6th annual LDV Vision Summit, we’ll be highlighting some speakers with in-depth interviews. Check out our full roster of our speakers here. Early Bird tickets now available for our LDV Vision Summit on May 22 & 23, 2019 in NYC at the SVA Theatre. 80 speakers in 40 sessions discuss how visual technologies are empowering and disrupting businesses. Register for early bird tickets before March 29! When Emi Gal was searching for the cofounder for his New York-based cancer detection startup Ezra, he pored over 2,000+ online profiles of individuals with expertise in medical imaging and deep learning. From there, he reached out to 300 individuals, conducted 90 interviews, and walked four finalists through a four-month project. The entire process took nine months. All while still at his “day job.” For Emi, that day job was his European startup that had just been acquired by one of its largest American clients. Not your typical founder’s story, but as his meticulous cofounder search shows, Emi is not one to take a blind leap. It’s this willingness to go methodically down the rabbit hole and to leave no stone unturned that’s defined Emi’s approach, from one venture to the next. To date, Ezra has raised $4 million in its first round, led by Accomplice and with participation from Founders Future, Seedcamp, Credo Ventures, Esther Dyson, Taavet Hinrikus, Alex Ljung, Daniel Dines and many others. Emi has since brought on a head of talent to help expand the team from two to 12 in four months. In this article, Emi talks about how Ezra is changing the game for cancer detection through visual technology. Read on to learn about his scientific research-driven approach, the long-term possibilities for Ezra, and what to expect when he takes the stage at our LDV Vision Summit this May. The name Ezra means “help” in Hebrew. It’s a spot-on moniker for a company that, although powered by artificial intelligence and visual technology, Emi says is more mission-driven than technology-driven. Multiple components in cancer detection rely on the painstaking study and analysis of visual inputs, making visual technology ripe for leveraging. In its current stage, Ezra is focused on detecting prostate cancer through full-body MRIs that are then analyzed by artificial intelligence. 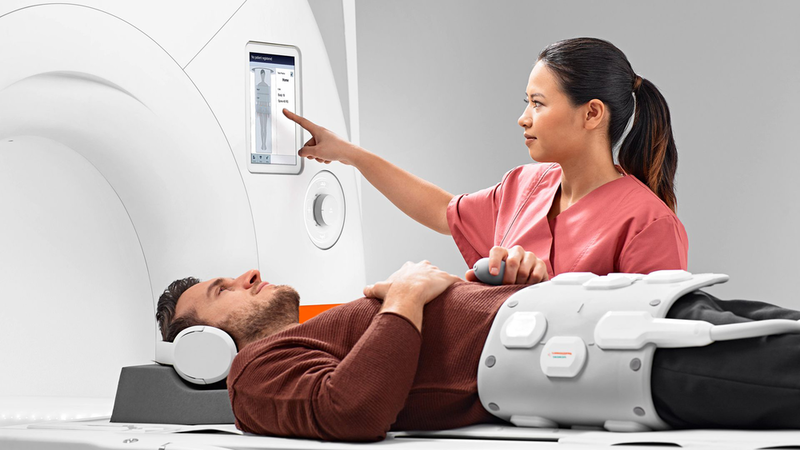 Ezra’s subscription-based model offers an MRI and access to medical staff and support at $999 for one year. The full-body MRI is a huge change compared to the most prevalent detection method for a cancer that kills 1 in 41 men: getting a biopsy, which is painful, uncomfortable, and can have unpleasant side effects. Magnetic resonance imaging, on the other hand, eliminates the discomfort and is more accurate than biopsies or blood tests. MRIs, however, are not without their costs: about $1,500 if an individual books one himself, sans Ezra. And then there’s the time a radiologist needs to scan it. The first thing a radiologist does is make a bunch of manual measurements of the organ in question — in Ezra’s case, the size of the prostate. If you have an enlarged prostate, you have a higher likelihood of having cancer. If there’s a lesion like a tumor in the prostate, radiologists need to measure the size and location of the tumor. They need to segment the tumor so they can make a 3D model so the urologist knows what to focus on. All of those measurements and annotations are currently done manually, which makes up about half of a radiologist’s workload. For the future, says Emi, the team is already considering how to use AI to accelerate the scanning process as well. While it looks like Emi has seamlessly gone from one successful venture to the next, the reality is a lot more nuanced. It was while he was still running Brainient, before it was acquired, that he started plotting his next move. In 2015, Emi was introduced to Hospices of Hope in Romania, which builds and operates hospices that care for terminally ill cancer patients. During his visits with doctors and patients, the seed of Ezra was born. Cancer struck a personal chord. As a child, Emi had developed hundreds of moles on his body, which put him at very high risk of melanoma. He started getting screened and going to dermatologists regularly from the age of 10 years onwards to make sure they weren’t cancerous. While he hasn't yet had any maligned lesions, he’s experienced the discomfort of biopsies firsthand, and he’s always been very conscious about the importance of screening. That accelerated educated is supplemented with an incredibly impressive team. It’s no surprise that Ezra cofounder Diego Cantor is equally curious and skilled, and brings an enormous technical repertoire to the table: an undergraduate education in Electronic Design and Automation Engineering, a master’s degree in Computer and Systems Engineering, a PhD in Biomedical Engineering (application of machine learning to study epilepsy with MRI), and Post-doctoral work in the application of deep learning to solve medical imaging problems. The scientific team is rounded out with deep technical experts: Dr. Oguz Akin (professor of radiology at Weill Cornell Medicine and a radiologist at Memorial Sloan-Kettering Cancer Center), Dr. Terry Peters, director of Western University’s Biomedical Imaging Research Centre), Dr. Lawrence Tanenbaum (VP and Medical Director Eastern Division, Director of MRI, CT and Advanced Imaging at RadNet), and Dr. Paul Grewal (best-selling author of Genius Foods). Ezra’s deeply technical team trained AI with data sets from the National Institute of Health marked up by radiology experts. On new data sets, the Ezra was 90% accurate at agreeing with the experts. As a lifelong learner who actively chronicles his year-long attempts to gain new skills and habits, Emi has picked up a thing or two about doing new things for the first time. “Learning anything of material value is really, really hard,” says Emi, who’s done everything from training his memory with a world memory champion to hitting the gym every single day for one year. This focus on the process and being comfortable with being uncomfortable came in handy when Emi, who studied computer science and applied mathematics in college, pivoted into cancer detection. Emi cycled through twelve potential ideas before deciding on Ezra’s current technology. At every turn, he researched methodically and consulted with experts. One of the promising ideas that Emi considered — shelved for now — is DNA-based liquid biopsies. “We’re at least a decade away from DNA-based liquid biopsies being feasible and affordable,” says Emi, who was searching to make an immediate impact. Emi has big plans for Ezra going forward, and this year’s LDV Vision Summit is one step in that direction. He hopes to meet people working in the vision tech space, particularly within healthcare. Although Ezra has been live just since January 7th of this year — 20 people were scanned in the first three weeks — its early results are very promising. “The first person we scanned had early-stage prostate lesions. That really makes you wake up in the morning and go at it,” says Emi. Out of the first 20 scanned, three had early-stage prostate lesions they were unaware of. Two early users came in with elevated PSA levels, but the MRIs showed no lesions, obviating the need to do prostate biopsies. The long-term potential for Ezra — going beyond prostate screenings — is also clear. Even though these results have been powered by AI and MRIs, Emi is emphatic that Ezra is not an AI company. “We want to help people detect cancer early...and we will build any technology necessary. We think of ourselves as a healthcare company leveraging AI, not the other way around,” he says. While Ezra’s current focus is prostate cancer, expanding to other cancers that affect women is on the horizon. After all, as Emi points out, “Women are the most preventative-focused type of individual, for themselves and their families.” To underscore that point, Emi says that many of the early adopters for prostate screenings have come at the encouragement of men’s female partners. “The way we are approaching expansion is based on cancer incidence. We’re starting with the cancers that are most prevalent across society, with prostate being one of them, breast, lungs, stomach, and our ultimate goal is to be able to do one scan a year and find cancer in any of those organs. If you’re building a unique visual tech company, we would love for you to join us. At LDV Capital, we’re focused on investing in deep technical people building visual technology businesses. Through our annual LDV Vision Summit and monthly community dinners, we bring together top technologists, researchers, startups, media/brand executives, creators and investors with the purpose of exploring how visual technologies leveraging computer vision, machine learning and artificial intelligence are revolutionizing how humans communicate and do business.